The Wide-Face Poster Frame from SwingFrame, swings open so that you can easily place, and quickly change your posters, graphics, advertising and other promotional signage instantly. This popular poster holder features hidden hinges and gravity lock. You can’t tell that it swings open ─and you don’t have to take SwingFrame’s poster display frame off the wall to change your posters or other prints. The 1” slightly curved metal profile presents SwingFrame’s Wide-Face poster display frame with a clean, contemporary custom picture frame look and style that can enhance any interior décor. If you’re looking for either a small or large poster frame size, the Wide-Face Poster Display Frame with its four popular metal finishes and lots of standard and custom frame sizes, provide designers and buyers with an attractive aluminum poster display frame solution for all kinds of corporate, retail and commercial projects. 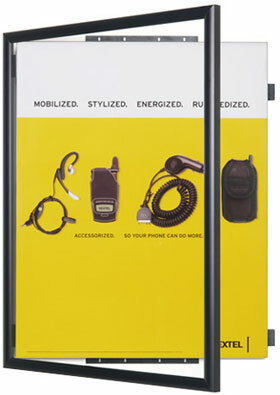 SwingFrame Wide-Face poster display frames have been used for retail poster displays, store fixtures displays, theatre poster frames, movie poster displays and numerous other applications in corporations, institutions, universities, healthcare, hospitality, exhibit, tradeshows, government and military facilities. All changeable poster display frames can be viewed at SwingFrame.com. SwingFrame Mfg. is a division of Access Display Group, Inc., located on Long Island, New York. The company designs, fabricates and distributes numerous wall mounted, aluminum metal and wood poster displays, poster holders, sign holders, poster cases and other easy mounting, quick change poster frames and displays used to display posters, signs, photography, advertising, graphics and other promotional signage for visual merchandising and visual communications. SwingFrame’s patented poster displays are used for wide-ranging applications, just about everywhere, including: retail stores, corporate offices and lobbies, sports and entertainment centers, movie theatres, hotels, motels and resorts, casinos, cruise ships, community centers, hospitals and medical centers, banks and credit unions, schools and universities, libraries, cafes and restaurants, trade shows, conventions, museums and exhibits, transportation centers, government and military facilities, and residential buildings. The list represents the wide acceptance of our Wide-Face Poster SwingFrames as well as other uniquely designed poster displays, display cases, sign frames and sign holders that meet the display needs of designers, architects, purchasing agents and buyers throughout the world.